How PRODUCTIVE will she be? How much MAINTENANCE will she need? The items listed here are specific to dairy cattle and would not all necessarily apply to beef or sheep, etc. If you learn what to look for, you can judge your own cow. Pretend you’re doing Livestock Judging at the fair! How would your cow place? What is really good about her? How can I use this knowledge when choosing a bull to breed her to next time? Below is a detailed list of what the American Jersey Cattle Association looks for when scoring cows. (DF) Dairy Form is defined as the openness and angle of rib, angularity, flatness of bone, length of neck, and any other appearance of milkiness. This appearance, and not just the absence of fleshing, is considered. Ideally, stage of lactation should not influence the dairy form score. Scores below 20 may not only reflect smooth overconditioned cattle, but also extreme angularity which is frailty and not dairy form. (I think you SHOULD realistically take into account where your cow is in her lactation when considering body condition and dairy “form”. Just fresh, she will not have much “spring of rib” and she may be a bit thick over her ribs and hips. She needs this fat to help maintain milk production. Within a month after breeding, the cow should begin to fill out and will drop some in production. Late lactation, the cow should be putting on some weight at a steady but slow rate. (RA) Rump Angle (pins high/low) is the degree of slope from hooks to pins when the cow is standing. A score of 1 indicates a high rump angle and a score of 50 indicates an extremely sloped rump angle. A score of 20 indicates a level rump angle, each additional five (5) points representing every one (1) inch of slope or height of pins. (RL) Rear Legs (posty/sickle) is a measurement of the set of hock. A score of 1 indicates extremely posty legs and a score of 50 indicates sickle hocked legs. A score of 25 indicates a slight set to the legs. (FA) Foot Angle (low/steep) is measured as the steepness of the angle of the rear foot from the hairline to 1” anterior to the hairline. A score of 1 indicates an extremely low foot angle and a score of 50 indicates an extremely steep foot angle. A score of 25 is assigned to a medium foot angle and a score of 40 to a 45° foot angle. (FU) Fore Udder Attachment is an evaluation of the strength of attachment of the fore udder to the body wall. A score of 1 indicates a loose attachment and a score of 50 indicates a tight attachment. A score of 25 indicates a slight bulge in the fore udder. (RH) Rear Udder Height is measured as viewed from the rear, at the crease where the udder meets the leg, in relation to the midpoint between the point of hock and pins. 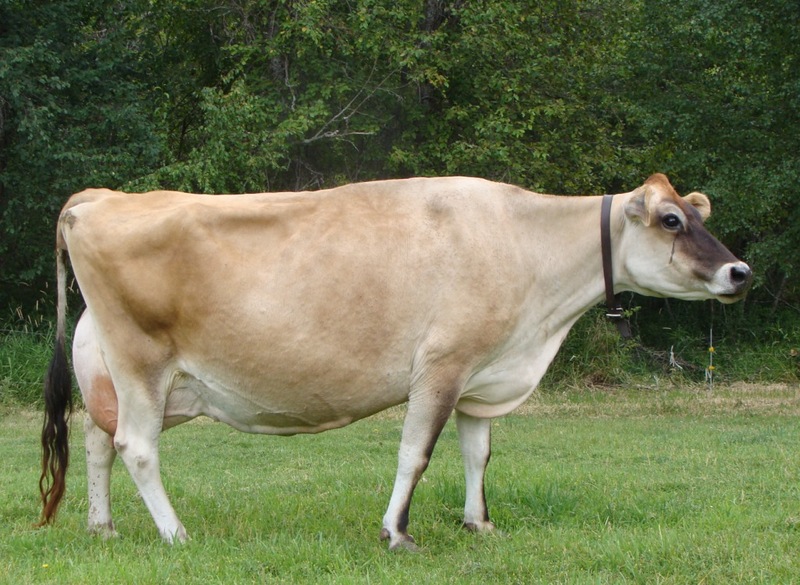 A score of 1 indicates low rear udder height and a score of 50 indicates high rear udder height. A score of 15 is assigned to a rear udder attached at the midpoint between the point of hock and pins. An additional 5 points is added or subtracted for every inch above or below the midpoint, respectively. (RW) Rear Udder Width is measured at the crease where the udder meets the leg. A score of 1 indicates a narrow rear udder and a score of 50 indicates a wide rear udder (11” or more). A score of 25 is assigned to a rear udder that is 7” wide with an incremental change of 5 points per inch in either direction from the midpoint of 25 (e.g., score of 30 indicates 8″ rear udder width, score of 20 indicates 6″ rear udder width). (A wide udder allows for room for milk production, is eye appealing, and indicates the presence of a wide rump, which is good for many reasons (see rump width above). (UC) Udder Cleft is a measure of the depth of cleft of the udder between the rear teats from the base of the rear teats to the point where the halves of the udder come together. The midpoint of 25 corresponds to a cleft of 1½” with an incremental change of 5 points per half inch (½”) in either direction from the midpoint. A score of 20 indicates an udder with a 1” cleft, with 30 indicating an udder with a 2” cleft. (UD) Udder Depth (deep/shallow) is a measure of the depth of udder floor relative to the hock. A score of 1 indicates an udder below the hock, 15 an udder at the hock, 25 an udder 2” above the hock, 35 an udder 4” above the hock, and 50 an udder 7” above the hock. Varies, should match age of cow, ideally above hocks (center or right box). (How low do you want to go to milk your cow? This is a trait especially made for hand milkers!! Get a snug udder so you can sit and reach out or up instead of down to milk! This is an important trait for beef animals, too, so the calf can nurse easily. Also, a high/tight/shallow udder attachment protects the udder from weather, dirt, and physical damage. A cow naturally protects her udder by keeping it between her legs, tucked up into her body as she is lying down. If she has a large udder, she is more likely to step on it (see fore udder attachment) or get it dirty, which leads to mastitis.) Take into account, the udder will likely become a little lower each time a cow calves. This is natural, but it’s still desirable to find a cow that at 10 years old has an udder “above the hock bone”. If milking with a Surge, it’s important that the udder stays shallow, so the machine (or on a bucket milker, the “claw”) still fits properly under the cow’s udder for safe, fast milk-out. (TP) Front Teat Placement (wide/close) is a measurement of the placement of the front teats on the quarter. A score of 1 indicates wide placed teats, 20 slightly wide placed teats, 30 centrally placed teats, and 50 teats that are closely placed. When evaluating a cow and just getting started, try to notice how these traits match up in good quality cows. So, you would interpret these numbers (each trait has a range of numbers as described above) to read that this cow is: about 50 inches tall, fairly strong, very good dairy form, high in the pins with 1 inch of slope to rump, average wide rump, good set to legs leaning toward too much set, medium foot angle, well-attached fore udder with a slight bulge, high rear udder, fairly wide rear udder, over 2 inches of cleft, an udder just above the hock, centrally placed teats, medium sized teats about 2.5 inches long. *Take into account that these numbers reflect the most recent score and because the cow has been scored 4 times, she is considered an “aged” cow, meaning these numbers should reflect an older animal and not, for example, a two year old cow. So, how does your cow score? Would you like your Grand Champion ribbon now? You make a good observation, though, in that once the heifers are near the day of calving, their ligament significantly “disappears” among the edema. What you are seeing is not a loosening of the ligament, but more stretching it and edema (fluid) surrounding it and hiding it. Both of the heifers in the photos have excellent ligaments. They “show back up” after the first few days of calving, once the worst of the edema is gone. Too bad we belong to the Beef Breeding Club – our 4H group is always looking for a guest speaker. Wonderful clear, complete explanation! very useful! What a great explanation! I’m sending this to my daughter for 4H. I’ve learned a lot. I learned how to pick a cow, and how to juge dairy cows. Thank you. This is very good information. My 4-H dairy judge last year asked me to point out good traits in a dairy cow, and wanted me to answer using more “dairy” terms. This page really helps. This is an excellent teaching page. Thanks! Is there anywhere that the score would reflect “cow-hocked?” My new grade Jersey heifer is cow-hocked (a term used with horses but I’ve never seen used with actual cows) and her back feet turn slightly out. That would go under the foot and leg traits. Unfortunately, appraisal has to be fairly quick, as most farms have a lot of cows to score each time. So, a few traits get bundled together. Another example would be “rib” and you’ll most often see appraisers add that to Dairy Form scores. One joke we make about cow-hocked is that we hope they get a nice wide rear udder to straighten those legs out! 🙂 We say she’s just getting ready for a great udder! This was very helpful. I knew the basics, but I didn’t know all this. I will know what to look for in cows we are considering to buy. Thank you. This is one of the MOST helpful and easy to understand explainations I have seen on this! Thank you!.. I am going to print it for my book. I KNEW Clarice was good, but dint know how good.. I am more than impressed with her now. WOOWHOOOO…. off to the next subject.